Cobblers boss Chris Wilder has hailed Yeovil Town boss Darren Way’s ‘outstanding achievement’ in steering the Glovers to safety in Sky Bet League Two. When Yeovil left Sixfields back on November 28 having suffered a 2-0 defeat, things were not looking good for the Somerset side. 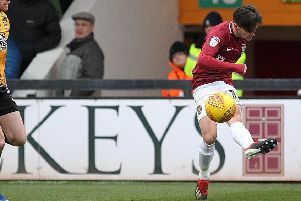 They were rock-bottom of the table, having claimed just 11 points from their first 20 matches of the campaign, and the defeat at the Cobblers proved to be Paul Sturrock’s last game in charge at Huish Park. The Yeovil board turned to ex-player Way to steer them out of trouble, and he has done that in some style. Yeovil guaranteed their league two survival a fortnight ago, and under Way have picked up 33 points in 23 matches to sit comfortably in 19th place ahead of their home clash against Northampton on Saturday (ko 3pm). “Yeovil have done outstandingly well,” said Wilder, who admits he is expecting a difficult day for his team in the south west. “It was after the game here at Sixfields that Paul went and Darren came in. “He is an ex-player and a coach and obviously he feels very passionately about that football club, he has played there and achieved so much as a player. “To see his team not doing so well, but for him to get hold of that club, to get hold of that team and turn it around is an outstanding achievement. Yeovil go into the game against the Cobblers without a win in four, but they picked up an excellent point at Wycombe Wanderers on Tuesday night. They lost their most recent home match, 2-0 to Exeter City two weeks ago, but that has been their only home loss since November 24.